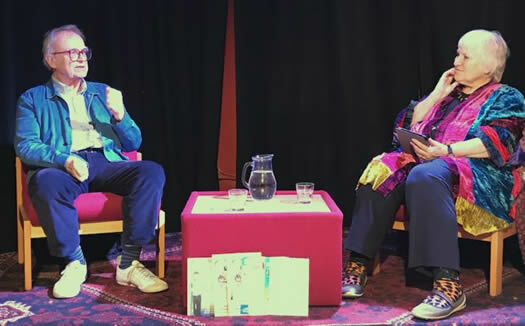 In conversation at Oxford's Story Museum, the veteran writer and actor reveals how to win over the world's toughest audience. As an actor, Wood (Worcester, 1963) is best known for playing Johnny in the 1968 film If. But as a writer, his adaptations of classics - from The BFG and The Witches by Roald Dahl to Tom's Midnight Garden by Philippa Pearce to The Tiger Who Came To Tea by Judith Kerr and Meg and Mog by Helen Nicoll - have enchanted generations of children, as have his screenplays, which include adaptations of Swallows and Amazons by Arthur Ransome and Back Home by Michelle Magorian. He had written plays for adults, such as The Go-Between, based on L.P. Hartley's novel. And he's the author of many original children's plays and books, most famous of which is The Gingerbread Man. But keeping small bottoms on seats is hardly straightforward. Wood (right) has learned that if adults in rehearsals think part of the script is hilarious, children in the audience probably won't. And children consider themselves part of the action, exploding through the fourth wall. In one performance of The Gingerbread Man, an actor foolishly paused for breath after delivering the phrase 'something to make him freeze' and children started shouting 'ice' and simply would not stop, leaving the cast on stage confounded. 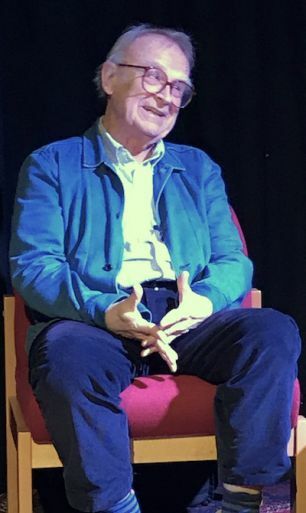 Wood considers it part of his job when writing plays to anticipate what the audience will say, and when, and their words are printed as part of his scripts. Another pivotal realisation for Wood came after he heard of a conversation a mother had with her daughter when the child said she liked a book. The mother asked why, and the daughter replied: 'Lots of suddenlys.' 'That, to me, was magic,' said Wood. 'It transformed what I was doing in play writing.' He started writing with 'suddenlys' on every page - from a phone ringing to a change in lighting or music to a new character to a 'new sting' in plot. Wood focuses solely on entertaining the children, not their parents. 'I don't think of the adults at all. Taking children to the theatre is a nightmare. The adults will enjoy it if the child enjoys it.' And he has found a number of things children usually enjoy. Humour, of course; changes in scale from the miniature to the giant; and animals. But also children are profoundly interested in 'injustice'. Wood explained: 'I believe we are all born with an innate sense of justice. The first thing a child learns to say is "It's not fair". That relates very much to storytelling - a child will root for an animal character who is mute and can't defend itself, or Cinderella.' Roald Dahl, he noted, was a genius in creating child protagonists who face a world with all odds stacked against them. Parents are, in several Dahl novels, killed at the start of the story, leaving the child to cope alone. There can be an edge of tremendous sadness in children's literature and Wood's plays don't shy away from showing, for instance, the horrors of war, in his staging of Goodnight Mr Tom by Michelle Magorian. In the film of Roald Dahl's The Witches, the boy who has been turned into a mouse by evil witches is turned back into a boy again. But in the novel, and in Wood's adaptation, the boy is left as a mouse. Films often seek to sanitise the sharp edges of children's literature with happy endings, Wood noted, and commercial pressures currently threaten original children's drama in Britain. 'Everyone wants the big title,' he said - big musicals or films of bestselling novels are what gets commissioned. But 'a lot of the best work is small scale'. 'Terrifyingly', as Wood put it, Winnie-the-Pooh is now owned by Disney. When Wood was planning a show celebrating children's literature for the Queen's 80th birthday in 2006, he wanted to bring the three famous bears together - Pooh, Rupert and Paddington. The people who own the rights for Rupert and Paddington agreed, but, he recounted, Disney took months to consider and ultimately refused to allow Pooh to appear next to the other bears. They eventually specified that the show could go on if there was a fence built around Pooh; the other bears could wave at him from a distance. And that is what Wood had to work around. While 'scraping through' his degree at Oxford - as he puts it in his seminal book Theatre for Children - Wood acted, directed and wrote for about three shows a term. He was an active member of the Oxford University Dramatic Society and the Experimental Theatre Club, performing not only at venues like the Oxford Playhouse but the West End and the Edinburgh festival. 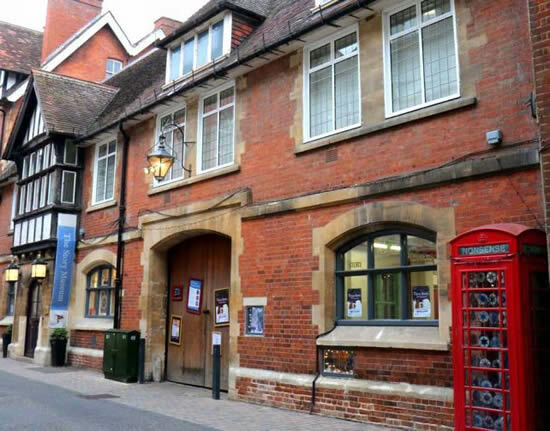 One particular show he saw as a student, at Oxford's New Theatre, proved an epiphany. It was a big commercial pantomime of Peter Pan, a book Wood had adored since childhood. The star turn cracked an adult joke over the children's heads and then said to the parents in the audience: 'Oh, come on, let's get the kids out of here and then we can get started!' For a blushing and irritated Wood, 'It was as though an electric shock had jolted me.' He thought: 'Surely those children deserved better. It struck me that there was very little theatre aimed at children.' That moment was a turning point in Wood's life - and he has carried his respect for children throughout his career. 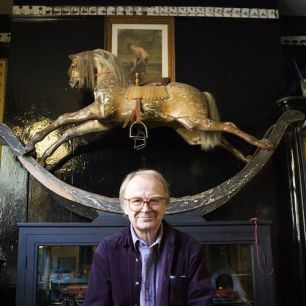 Photographs of David Wood in conversation with Libby Purves by Olivia Gordon; publicity still courtesy of David Wood; Story Museum photograph by Steve Daniels via Geograph, under Creative Commons licence.